Campsie Minerva lifted the Central Scottish AFL Cinema Cup with a 2-1 win over Motherwell side Colville Park in the final. Colville went into the match as favourites, having already lifted the Scottish Amateur Cup and Central Scottish Premier Division title this season. But it was Minerva who took the trophy with a last-gasp winner in the final played at Kilsyth Rangers’ Duncansfield Park. East Dunbartonshire in the past has been blessed to have some of the very best amateur football teams in Scotland. But recent times have seen more than 50 per cent of clubs with a proud history go to the wall - teams like the once famous Campsie Black Watch are no more, alongside teams like Redbrae and Kirkintilloch Miners Welfare, who were both until very recently competing in the top amateur league in Scotland are all now sadly lost to the game and consigned to the history books. Things have got that bad recently that even Waterside Amateurs have had to take a local under-21 side under their wing just to field a team and see out their fixtures. It’s now only Campsie Minerva and Harestanes who are flying the flag for the district in the top amateur league in Scotland, the Central Scottish Amateur League. Harestanes only very narrowly avoided relegation from the top flight this season and it would be fair to say that amateur football in the local area may be on the slide. The Central Scottish Amateur league has, in the last five years, been the stomping ground for the winners of the Scottish Amateur Cup, the greatest amateur football accolade in the land. Last year Harestanes took the trophy but this year that honour went to the all-conquering Colville Park AFC, who also won the aforementioned league - so it was a daunting task for Minerva as they both met in the Cinema Cup Final last Wednesday at Duncansfield home of Kilsyth Rangers. The playing surface at Duncansfield could only be described as sublime and with the prospect of a warm, sunny evening the signs were there for a larger than usual crowd. The kick-off had to be delayed for 15 minutes to let the crowd in and there was nearing 800 fans in the ground by the time the game got under way. Minerva quickly took the game to Colville and could’ve taken the lead as early as the first minute when Christopher Smart went through only for an alert Colville keeper to foil him. The Minerva pressure continued and the Kirkintilloch side were rewarded when they took the lead on 15 minutes. A free-kick from the right was whipped over by Kyle McAulay and met superbly at the back post with a diving header by midfielder Paul Kemmitt. The best amateur team in the country were left in no doubt that they now had a game on their hands and were lucky not to be two down 10 minutes later, only the bar stopped in-form striker Scott Lochead from scoring. However Minerva were reminded just before half-time that the Scottish champions weren’t going to take this lying down and had Owen McCallum to thank for an outstanding save to keep his side ahead at the break. On this form it’s no wonder the young shot stopper has been called up to the Scotland amateur set-up for the forthcoming internationals. The second half started with Colville proving why they are regarded as the best amateur side in Scotland by pinning Minerva back for long spells. But Minerva’s back four of Tommy Neil, Steven McGregor, Andrew Gow and Callum Harris were doing a great job in preventing them scoring, that aided by the tireless midfield work of Kemmit, Grant Lightbody and Johnathon Howat. And any time Colville did get through they couldn’t get past an inspired keeper in McCallum, a young man who seems destined to play at a higher level in the future. Colville did eventually equalise after some tremendous pressure with 10 minutes remaining, a through ball which was deflected and fell to Mulvey who finished well. 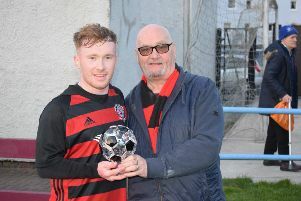 It was no more that they deserved and Minerva manager Grant McKie decided on one last throw of the dice as he quickly ascertained that 30 minutes of extra time against the best team in the land might not be in the best interests of his own team, bringing on himself and youngster Rab Nicol. As ever Minerva never let their heads go down and kept battling away with Smart, McAulay and McKie now causing problems. And with 30 seconds left on the clock Nicol managed to get a pass through to Howatt who found himself one on one with the ’keeper and had the audacity to chip the ball over him into the net to spark great celebrations. It’s fair to say that with this result Campsie Minerva have put amateur football in this district well and truly back on this map. This was endorsed when the office bearers of the Central Scottish Amateur League presented Minerva captain Steven McGregor with The JB Tyres Cinema Cup trophy. As member of that committee, Kirkintilloch man Jim McKinny could hardly contain his delight at a local team defeating the Scottish champions. Man of the match was awarded to Minerva elder statesman Gow who never put a foot wrong in the centre of defence and when the officials received their medals referee David Sommers was given a rapturous round of applause, lending more weight to him being regarded one of the best officials in the land. On what was a great night Minerva would like to thank everyone who turned up in their numbers and for all the support throughout the season - with special thanks to sponsors Joe and Caroline at the Commercial Lounge and local businessman Tom Lenaghan. The Minerva team will this week now embark on their annual end of season break to Spain in high spirits. Minerva: McCallum, Neill, Gow, McGregor, Harris, Kemmitt, Lightbody, Howat, Smart, McAulay, Lochead. Subs: Neilson, Brodie, McCaig, Nicol, McKie.